I ran my first 5k race two years ago. I wasn’t necessarily interested in running but my sister-in-law thought it would be fun and I thought “sure, why not!” I put together a playlist, bought a new pair of runners and attempted to run around the block a few times before race day. On the actual race day, I huffed and I puffed and I ran but I mostly walked fast. I completed the race in 42 minutes. That isn’t the greatest time but I was so happy to cross that finish line. The race was my first and I was convinced it was my last but turns out that I ended up having a love/hate relationship with running. After that, I signed up for a running room 10 week clinic… twice. I signed up for 2 more 5K runs and another 10K run but no matter how much I wanted to be a runner, I was as slow as molasses and could never really run more than 10 minutes before needing a walk break. So why did I sign up for another race? Well I got caught up in the excitement of running it with my friend C. She’s been training and her goal is not to just run it but to run it non stop. I don’t want to let her down so I finally started to train 2 weeks ago. I’m not sure if it was because we had such a long winter or because I’m eating healthier now than ever before but I’m really enjoying my runs. Crazy right? I started small by running 3k and slowly been adding some more distance each time I went out. 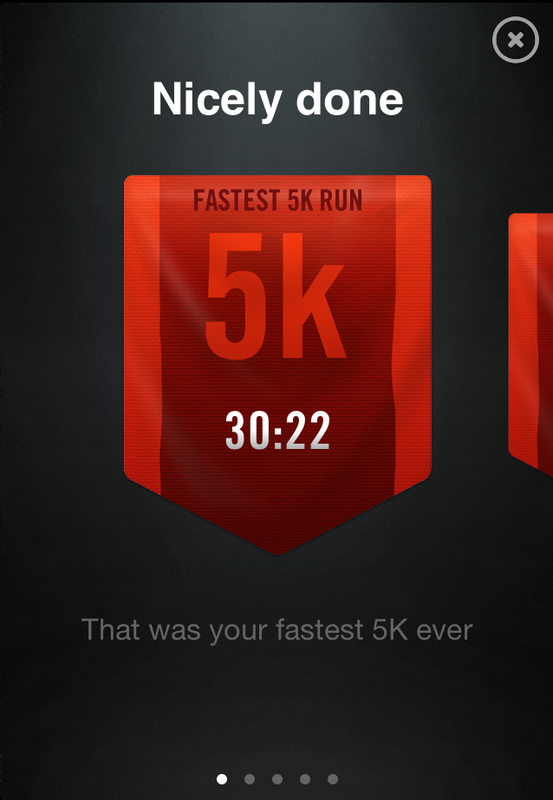 I struggled a bit on my run after Easter, too much chocolate and white bread but this weekend I finally did it. Did what? I’ll tell you! I ran a whole 5 kilometres WITHOUT stopping. Yep folks, you heard that right. I huffed and I puffed but I didn’t slow down to take any walk breaks. This may seem like a walk in the park for some but to me, this is huge! I may have experienced runner’s high. I’m not sure though so I have a few more weeks to keep training before the big race but until then, I agree Nike+ app… Nicely done!